For optimal performance, select the model that will support the total weight of your monitors and all items that will be placed on the Winston work surface. This will include your keyboard and mouse. The typical weight of keyboard and mouse is between 2-4 lbs. Please note, the monitor and the worksurface move in tandem, and not independent of each other. Looking for a triple monitor workstation? Looking for an electric workstation? Winston double monitor stand can mount two 30" monitors on a freestanding base. 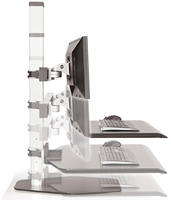 With no drilling required, this adjustable workstation is ideal for glass desktops. Easily move 10-26 lbs up to 17" by simply pulling on the workstation with your hands to find your ideal working height sitting or standing. Winston sit-stand workstations encourage a healthier lifestyle. Standing at work for even three hours a day can offer the same health benefits as running 10 marathons a year, and even extend your life by two years. Additionally, tabletop standing desktops can help counter several health concerns caused by a sedentary lifestyle including obesity, type 2 diabetes, cardiovascular disease, and cancer. The large but compact 30" x 18.3" work surface of this adjustable monitor stand make it perfect for desks less than 24" deep. Include your keyboard, mouse, phone, writing materials, and other necessary items right on this dual workstation desk which was designed for stability to eliminate a wobbly desk. With a sleek, professional design Innovative's multi-monitor stand will fit into several work environments and industries, including security, IT, maintenance, gaming, programming, and designing. Convert your desk to a healthy sit-stand workstation in minutes. 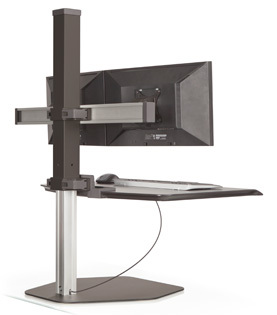 Winston Workstation dual freestanding sit-stand supports a two monitor setup and features push-button height adjustment. Healthy sit-stand workstation. Dual monitor mount. Compact work surface ideal for smaller desks. Locking cylinder add stability, easy height adjustment. Question: What is the difference between WNST-2-CM-H Winston Workstation Dual (25-44 lbs) and the WNST-2-FS-H Winston Workstation Dual (25-44 lbs)? Also, with respect to mounting options.. "freestanding" seems self-explanatory, what is the difference between "desk clamp" and "thru clamp"? Answer: The WNST-2-CM-H refers to the desk clamp option, in which the Winston attaches to the edge of the desk. The "thru mount" also attaches the Winston to the desk but by drilling a hole in the desk. Question: During assembly, will I be able to decide how far apart my monitor and keyboard tray will be? Can I screw the monitor bar in wherever I want, or are there pre-drilled holes/locations where they will be? I'm worried that I won't be able to get the right distance between the keyboard tray and the monitor. I noticed a lot of the images, people appear to be looking down at the monitors because of where the keyboard tray needs to be, and I want to be sure I am looking straight ahead. 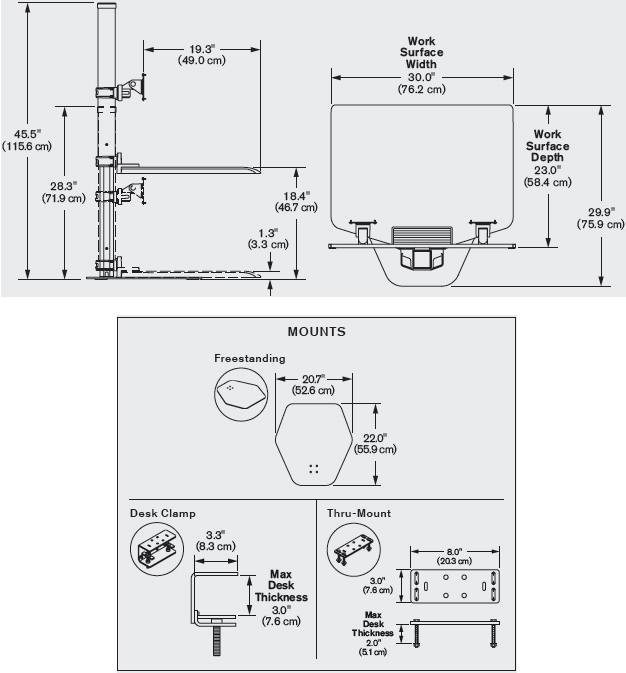 Answer: This workstation has multiple mounting options (please see option 3 on page). A Freestanding base is included. There is also an option for a clamp mount and thru mount if you would like to use Grommet. The Freestanding base could be moved around wherever there is adequate desk space to accommodate the base, the clamp could of course only be clamped to edges of desk, and the thru-mount requires a grommet hole. The height between the monitor and keyboard tray is adjustable. The clamp around the column that is holding the horizontal beam the monitors rest on would need to be unscrewed. Once it is loosened, the clamp can be raised or lowered along the column to change the distance between the keyboard tray and the monitor. Love the desk, it holds two large screens, is very stable and easily adjusts to any height needed. The unit is very stable and well designed. It is working just as I had hoped it would work.